Bartele Gallery offers many old fashion and costume prints. Antique fashion and costume prints are highly decorative and certainly enhance your living space. We offer fashion and costume prints from all over the world including many French fashion prints and Asian costumes. Bartele Gallery heeft veel oude mode en kostuum prenten. Antieke mode en kostuum prenten zijn zeer decoratief en zijn zeker een aanwinst voor uw interieur. Wij bieden mode en kostuum prenten van over de hele wereld zoals onder andere Franse mode prenten en Aziatische kledij. 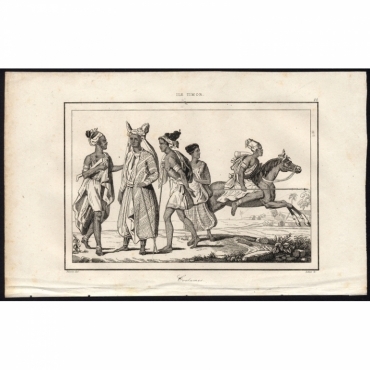 Antique Prints | Fashion & Costumes There are 226 products. Antique print, titled: 'Alfouras en grand Costume, Instruments de Musique - 67, Borneo', A man in festive costume (with feathered spear and shield), and music instruments. 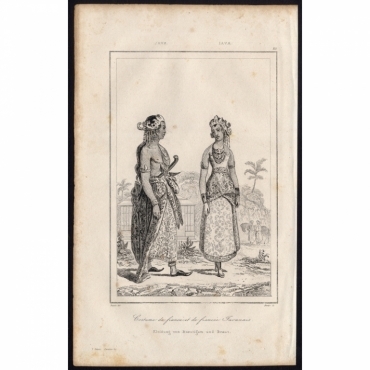 Antique print, titled: 'Costume de fiance et de fiancee Javanais - 25, Java', Costumes of a betrothed couple on Java. 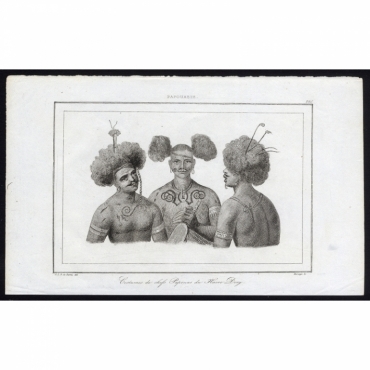 Antique print, titled: 'Costumes de chefs Papouas du Havre Dory - 220, Papouasie', Costumes of the Papua chiefs of Dory harbour (New Guinea), focusing on their head and upper body. 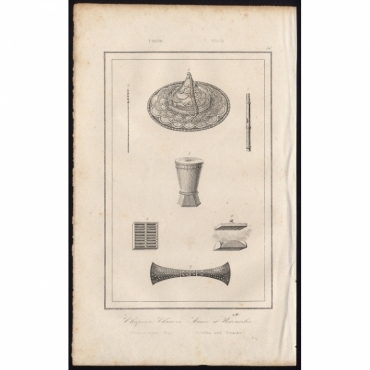 Antique print, titled: 'Chapeau Chinois, Armes et Ustensiles - 50, Timor', A Chinese conical hat, weapons and utensils. 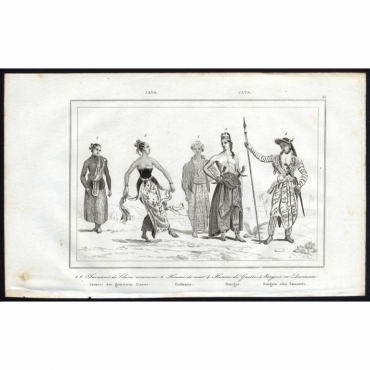 Antique print, titled: 'Javanais de Classe commune, Homme de cour, Homme de Guerre, Ronguin ou Danseuse - 24, Java', Javanese commoners, a courtier, a warrior and a female Ronggeng dancer. 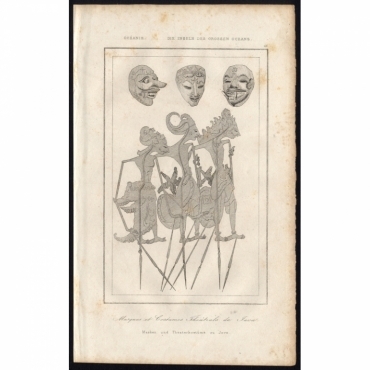 Antique print, titled: 'Masques et Costumes Theatrals de Java - 16, Oceanie', Masks and wayang puppets from Java. 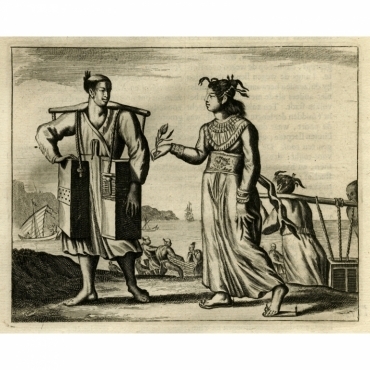 Antique print, titled: 'Les chefs de Chongui et Touai, l'un en costume National, l'autre en costume Europeen - 181, Nouvelle-Zeeland', Chongui and Touai Maori chiefs, one in traditional dress, the other in European dress. 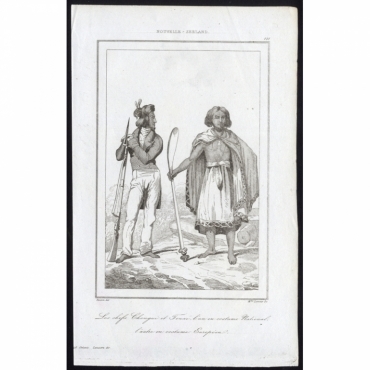 Antique print, titled: 'Costumes - 44, Ile Timor', Timorese costumes, including one of a mounted warrior. 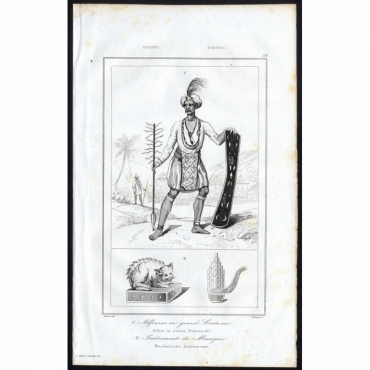 Antique print, titled: 'Costumes de Guerriers - 59, Iles Celebes', Warrior costumes of the island Celebes (or Sulawesi) in Indonesia. 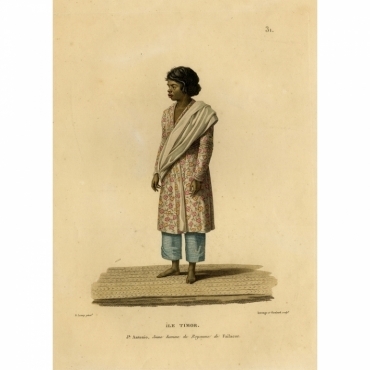 Antique print, titled: 'Coupang: Ile Timor. Divers Costumes.' - ('Coupang, Timor Island. Various costumes'). Three figures in the native dress of the Indonesian island Timor. 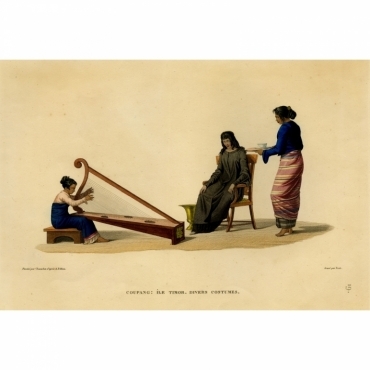 A young woman plays a harp-like instrument while another brings a bowl of soup to the third figure. Antique print, titled: 'Ile Timor.' - ('Timor Island'). Full-length portrait of a native female from the Indonesian island Timor. 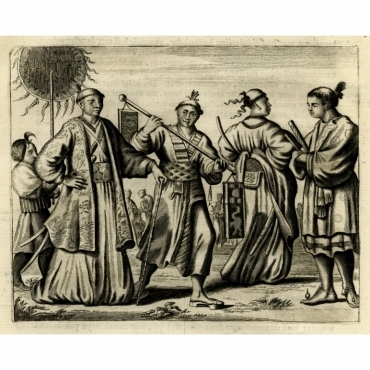 Antique print, titled: 'Habits of Japonese.' - Two figures dressed in Japanese clothing. Antique print, titled: 'The Laplander.' - An inhabitant of Lapland standing beside a domesticated reindeer. A hut in the background. Antique print, untitled. Six South American figures: a Spanish woman from Quito, a distinguished native woman, a native barber, an old widow from Quito and a native farmer. 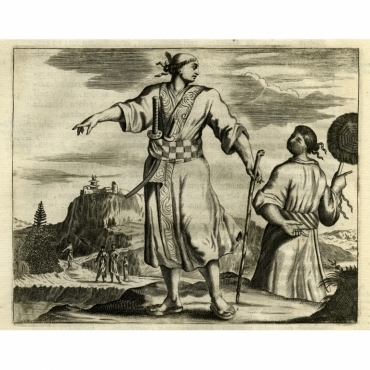 Antique print, titled: 'Kleeding der Japansche Heeren.' - ('Clothing of Japanese gentlemen'). The image shows a Japanese couple in characteristic costume (kimono). A second man is turned away from the viewer (to illustrate the rear of the man's costume). 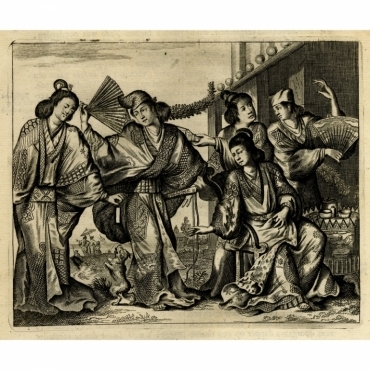 Antique print, titled: 'Het prachtig Gewaad eens Japansche Mevrouw.' - ('The splendid robe of a Japanese lady'). Five female figures outside a building. Antique print, titled: 'De dragt eens gemeinen Japanschen burger.' - ('The dress of a regular Japanese citizen'). 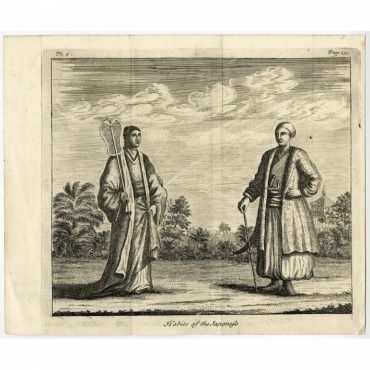 A man and woman stand side by side, each in their respective dress. Antique print, titled: 'Dragt der Voorname Japanders.' - ('Costume of distinguished Japanese'). A distinguished gentleman with two servants and two other figures. 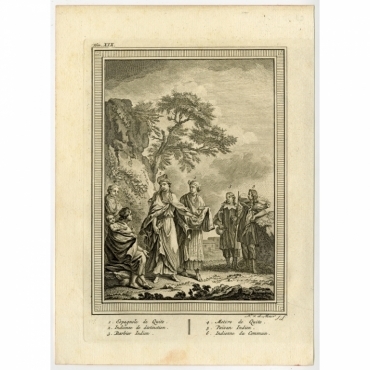 Antique print, titled: 'Dragt der Eilanders op Bungo.' - ('Costume of the islandfolk of Bungo'). Bungo is now known as the Aito province in southern Japan. The image shows a couple of man and woman. The man holds a spear. A second couple in the background. 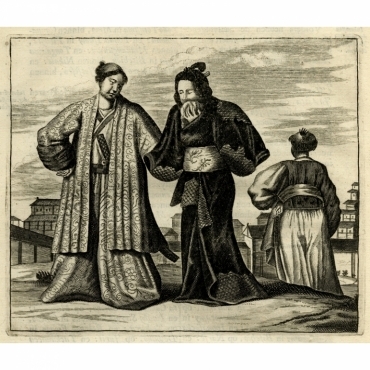 Antique print, titled: 'Kleeding der Japansche visschers.' - A couple of Japanese fishermen (man and woman). 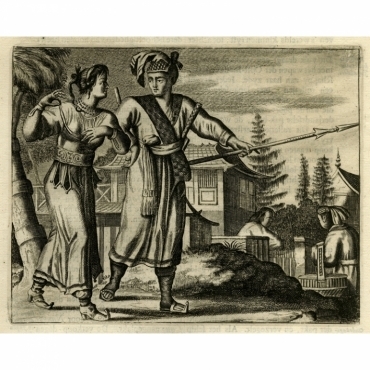 Antique print, titled: 'Een Japansche Juffrouw.' - A Japanese miss. Several young Japanese women in kimono. 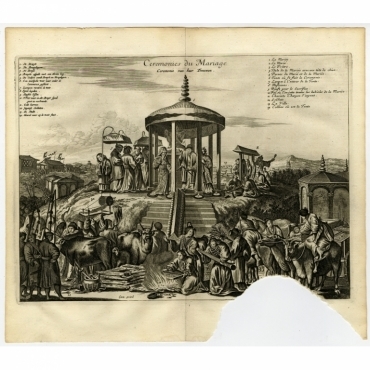 Antique print, titled: 'Ceremonies du Mariage. Ceremonie van haer Trouwen.' - ('Marriage Ceremonies'). Bride, Groom, priest, and parents are all identified, as is the bride's idol. Musicians and soldiers are persent, as well as cart with money. A small fire burns in which the bride burns toys. Antique print, titled: 'Een Rouw-dragende Japander.' - ('Japanese mourning dress'). 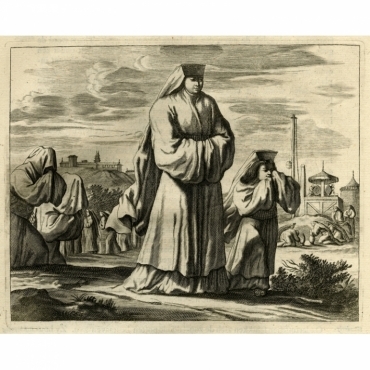 A woman and her daughter in mourning attire. Several other robed and hooded figures present. 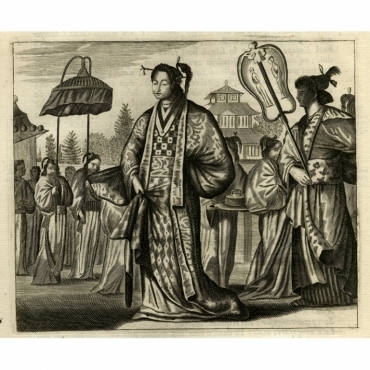 Antique print, titled: 'Een Japans Edelman.' - A Japanese nobleman. 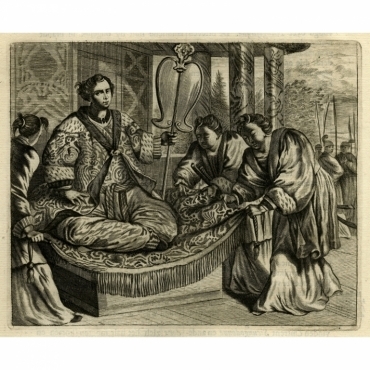 The noble is seated on a low dais, with three servants beside him. Armed guards in the background.